My mom recently got a new Android phone which allows her to go online via the Wi-Fi which my sister has set up at home. It really should not surprise me, but she has gotten into Facebook way faster than I thought she would. It reminds me of something I picked up a while ago – that seniors are the fastest growing demographic online. And if this new popular video is any indication, we are going to see more of seniors everywhere online. 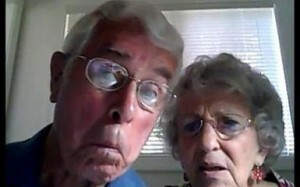 It’s really called Webcam 101 for Seniors, and it has gone viral, in the truest sense of the word. In case you have not seen it yet, this video features two senior citizens who accidentally recorded themselves as they tried to figure out how to work the webcam. Bruce and Esther Huffman of McMinnville, Oregon got a new laptop, and just like anyone (regardless of age group), they spent some time testing their new tool. Who can blame them? I bet practically everyone has done something like Webcam 101 for Seniors, albeit maybe with “for Seniors” removed. The big difference is that the Huffmans actually recorded themselves – even though unintentionally! The even bigger difference is that the couple seems to have brought back the feeling of something good. It’s not everyday that you see elderly people being all so chipper and playful with each other. They have genuinely sweet moments in the video – something that is refreshing and somehow innocent. In this society which is full of negative news, it is easy to see why a Webcam 101 for Seniors touches something in us. Well, maybe for some it’s all about fun and hilarity, but just watch the video, and you might just see what I mean.